Ambulyx liturata Butler, 1875, Proc. zool. Soc. Lond. 1875: 250. Type locality: Not stated. Synonym. Ambulyx rhodoptera Butler, 1875. Wingspan: 106--134mm. Sexually dimorphic. Distinguished from Ambulyx maculifera by the absence of a sub-basal costal patch on the forewing upperside, although occasionally a longitudinal dash is present instead; the mesial line of the abdomen upperside does not become dilated into a patch on abdominal tergum A8 of the male. Differs from the continental forms of Ambulyx substrigilis substrigilis by having the base of the hindwing upperside less tawny and never black and by the submarginal line of the forewing being more proximal posteriorly. 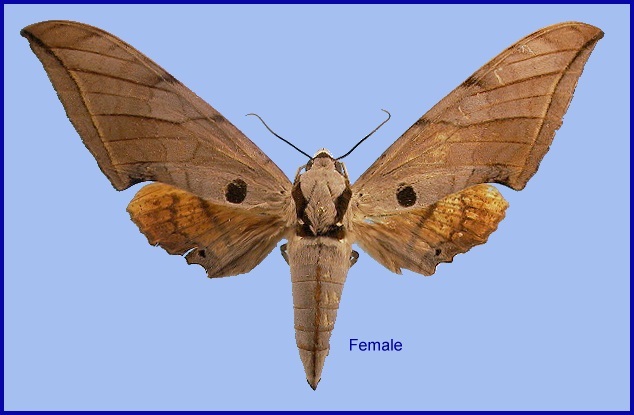 Some females are as pale as the male, others are more deeply tinted and have a more distinct violet-grey gloss on the forewing. In the male genitalia, abdominal sternum A8 convex mesally and with margin thickened. Gnathos similar to that of Ambulyx placida, more deeply sinuate than in Ambulyx substrigilis. Harpe with an almost vertical submesal process at distal end of submesal ridge; distal process very broad, spoon-shaped. Aedeagus with two dentate folds of unequal length; dorsally wall extended into a short obtuse process. In the female genitalia, abdominal tergum A8 membranous mesally so that sclerite is deeply incised. Sterigma surrounding very large ostium bursae; proximal part membranous; edge of ostium raised to a folded ridge; distal part of sterigma rounded, transversely multicarinate. The moth is excitable and flies readily when agitated (Bell & Scott, 1937). China: iii (Guangdong); iii-iv (Hong Kong); vi-vii (Guangxi; Yunnan); 5.viii (Yunnan); viii (Fujian; Hong Kong); xii (Guangdong). OVUM: Green, broadly oval (2.0 x 2.3mm), surface smooth and shiny (Bell & Scott, 1937). LARVA: Full-fed 60--100mm long, 13mm wide. According to Bell & Scott (1937), in the final instar, shape as in others of the genus. Head triangular, horn long, slightly up-curved. Surface of head smooth, with a few minute tubercles on the apex of each lobe. Body dull, with no tubercles on the secondary segmental rings, but with a single line of long conical tubercles starting subdorsally from the front margin of thoracic segment 2 and becoming dorso-lateral on 3 to 11; the tubercle at the front margin of 2 to 5 is the largest. The tubercles then decreasing in size to the hind margin of each of these segments. From 6 to 11 the tubercles increase in size from the front margin to the hind margin of each segment. 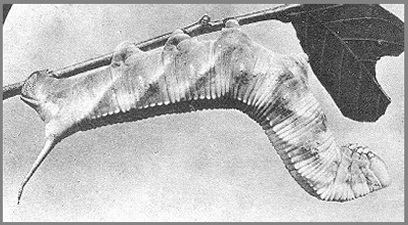 Horn without tubercles. In colour, head greyish-green, with a white subdorsal stripe dorsad from the apex of each lobe to the nape, where it joins the subdorsal stripe of the body at the front margin of segment 2. There is also a dark dot near each basal angle of the clypeus. Body green with a blurred white dorso-lateral stripe from segment 2 to base of horn, this stripe being broadest at the caudal margin of 4. A line of long tubercles is situated on this stripe, which are white on 2 to 4, salmon-red on 5, and still more red on 6, where the red colour expands backwards and downwards into a triangular patch reaching from just below the dorso-lateral stripe to the level of the spiracle at the hind margin of the segment. There is a corresponding larger, rhomb-shaped patch on segment 7, which is purplish-red with a salmon-coloured centre and some salmon-coloured spots edged with purple. Similar patches on exist on segments 8 to 11, decreasing in size backwards; segment 12 is devoid of any patch. The oblique lateral stripes are whitish, best defined on the posterior segments, that on segment 5 being obscure, edged above with sap-green, and interrupting the dorso-lateral stripe without extending above it. Horn bluish-green. Legs yellowish-grey ringed with rusty-brown; prolegs and claspers green bordered with rust-brown. 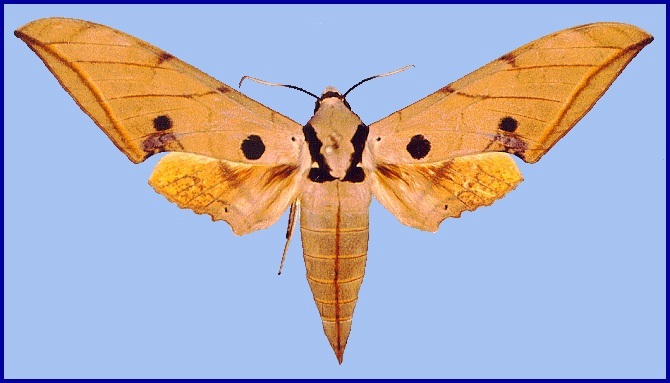 Spiracles oval, pale blue with a slightly raised, paler-coloured central slit and a narrow dark rim; the whole situated on a smooth, flat patch of the body colour (Bell & Scott, 1937). PUPA: 45--60mm long, 15mm wide. Colour dark chestnut, with a shape much the same as in others of the genus. Surface shiny, weakly pitted; the wing-cases finely, transversely lined, the veins somewhat prominent and slightly beaded, the costal edges raised above the tongue and more strongly beaded. There is a slight keel along the dorsal line of segments 4 to 6. Ante-spiracular ridges on 9 to 11 very faint. Cremaster stout, conical, rugose, longitudinally ridged, the tip short, either a simple point or extremely minutely bifid (Bell & Scott, 1937). Pupal cell lined with silk-slime. 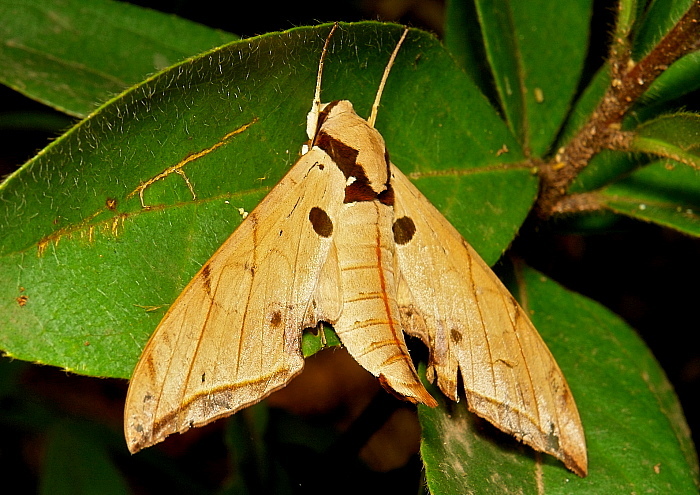 In India, the time spent in the pupal state varies from 12 to 32 days in the summer, and in the winter, when the pupae hibernate, from 153 to 207 days. Larval hostplants. Canarium album (Burceraceae) in China; Quercus and Castaniopsis are also recorded from India (Bell & Scott, 1937). China: Anhui (Mt. Huang Shan); Hubei (Lichuan; Badong); Sichuan (Wulong; Pengshui; Emei Shan; Xiaolou); Yunnan (Simao/Pu'er; Laojun Shan, 2579m; Mengla County, Mt. Leigongyan, 2000m; Gaoligong Shan); south Xizang/Tibet (Mutu, Namjagbarwa region, 850m (Wang, 1988)); Hunan (Dayong); Fujian (Guangze, 1200m; Longqi Shan); Guangdong (Longtou Shan); Guangxi (Guiping Station, Longtan National Forest Park); Hong Kong; Hainan. Nepal (Haruta, 1992), Bhutan, northeastern India (Sikkim and Assam), Myanmar/Burma, Thailand, Vietnam to Fujian and Hong Kong, China.